[Redacted]: Hello, are you conscious? Subject: Huh? What? Where am I? My head... Ow. Subject: Coffee. Where am I? Coffee? Can you unchain my ankle, please? You have nothing on me. [Redacted]: Usually someone in your position says "I didn't do anything wrong." But you said "You have nothing on me." That's interesting. Subject: Coffee. And, uh, how may I be of service to you this fine day-cycle, Inspector? [Redacted]: That's "Inspector Investigator." We'll get you some coffee. Subject: (wipes his nose on his sleeve) Get on with it. [Redacted]: The Fuel Rats. We have questions about the Fuel Rats. Subject: (mumbling) Snickers bars. (louder) We have fuel, you don't. And all that. Where's my coffee? Can I have some sugar for this ... oh, "gym sock" is my favorite flavor. What do you want to know about the Fuel Rats. [Redacted]: Normally at this point in the proceedings, we'd bash you on the head with a board. To make the conversation flow better. Where did the Fuel Rats come from? Who is behind them? The Fuel Rats created the Fuel Rats. Really, they just sort of sprung into existence one day. Who's behind them? You mean, like, "pulling their strings"? The Fuel Rats are behind the Fuel Rats. [Redacted]: The Fuel Rats lose a tremendous amount of time and money rescuing people; none of this benefits them at all. We suspect it's a cover for a massive intelligence operation. Or smuggling. Or something. Subject: Well, me'n Mossfoot was in a bar. And Alec Turner was there. And I was telling them about the time I nearly went to Hutton Orbital. I ran out of fuel practically within sight of the station. It cost me my cargo of Leestian Evil Juice, and a big insurance co-pay. So they were laughing at me and I remembered I'd read a brochure about the new Transdyne refuelling drones that were coming out soon, and I said, "hey, what if there was a bunch of CMDRs that refuelled people who were stuck? What if if was a bunch of really awesome CMDRs?" [Redacted]: Massively successful organizations don't start that way. There's more you're not telling me. Subject: Well, Mossfoot said he was bored. There was that, too. And probably some alcohol was involved. But other than that, the Fuel Rats pretty much wished ourselves into existence. I made the sign and hung it up, and a couple other CMDRs gathered around and said, "If someone needs help, I'll help." And I thought we needed an awesome slogan and maybe some awesome logos. Because we were going to be doing something awesome that was completely pointless, and all we'd get out of it was the joy of having done something awesome. Basically, being a Fuel Rat is like winning the biggest bar bet, ever. I mean, we have fuel and you don't. We're awesomer, uh, more awesome than you. [Redacted]: I have your ankle chained to my floor. I have the key and you don't. Any questions? The politics of the Fuel Rats. You are an autonomous/anarchic collective. Who the [Redacted] came up with a crazy cover story like that? Subject: I came up with the idea of not having an organization. It's because I was once part of a bowling league [Librarian: cross-reference "bowling"] and there was a lot of infighting about who was the team leader and all kinds of things like that. 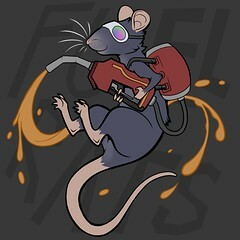 So I thought that an organization like the Fuel Rats were going to be, would fall apart if it had rules and bylaws and a hierarchy and all that. While I was sitting there, half smashed, I think I blurted out the Doctrine Of Individual Excellence and Alec wrote it down with a magic marker on the wall by the bar. That was where our slogan came from, too. Mossfoot said we had to have a cool slogan, so I sloganed really fast and that was it: "We have fuel, you don't. Any questions?" [Redacted] So you're the leader of the Fuel Rats? Subject: What? Have you not been listening to me? What kind of interrogator are you - you're not listening to me. We are all the leaders of the Fuel Rats. Each of us, basically, does whatever the [Redacted] we want to, as long as it reflects well on the honor and the glory of the Fuel Rats. That's the Doctrine of Individual Excellence: "do your best." By setting the bar really low, we actually wind up breaking every record in the book. I mean, we set the records, then we break them. It's pretty awesome, really. Can I have more coffee? Why do you do these things for no money? You lose huge amounts of money and time and effort and you get nothing in return! Subject: We get the awesome.